This workbook is designed to accompany section Azuqua 101. Your team is using a tool like Smartsheet to manage workload. A Project Manager is creating tasks - but perhaps team members aren’t always looking at the sheet! The team lead wants to notify team members via Slack because - as with most companies that use Slack - your team members are commonly engaged with it on a regular basis. Note: At this point in the tutorial we are not selecting an app. We’re doing this so we can test without being dependent on an event. In Exercise 101-6 we will add and test the completed FLO. Now, let’s add a new action by selecting +Action - “Read Row”. Here we will get the Row ID from the Event (New Card in List). Then, we will retrieve information about that card that we’ll import into Slack. Create a single row using the Start Date as today. Authenticate with your account & NOTE: You should see a GREEN DOT next to your connector if it’s configured correctly! As you learn Azuqua FLO Building, it’s important to get a sense of what’s happening - so here we’re going to add cards and test them as we go. The Row ID is listed on this page as you can see in the following image. Copy this string. Next we need to inspect the message and see that it contains a specific value. In other words, let’s add some smarts to our FLO and make sure this only runs IF the task is assigned to a specific person. To do this, we’ll use the “Continue If” function. Continue If will continue or halt the FLO based on the result of a true or false conditional test. Test your entire FLO by clicking the Yellow Play button at the top of the screen. If configured correctly, this card will only continue if this condition matches. This will give our team member all the details without having to login (at least now) to Smartsheet! We don’t need to test this quite yet, but if you wish you can do the same as you did with the Read Row card by clicking the “Play” icon at the bottom of the card. For this section, we’ll use Slack. As with other applications featured within this workbook, to follow along you can use an existing Slack account, or a free one. Again, test your FLO. If everything worked correctly, you should get a notification. 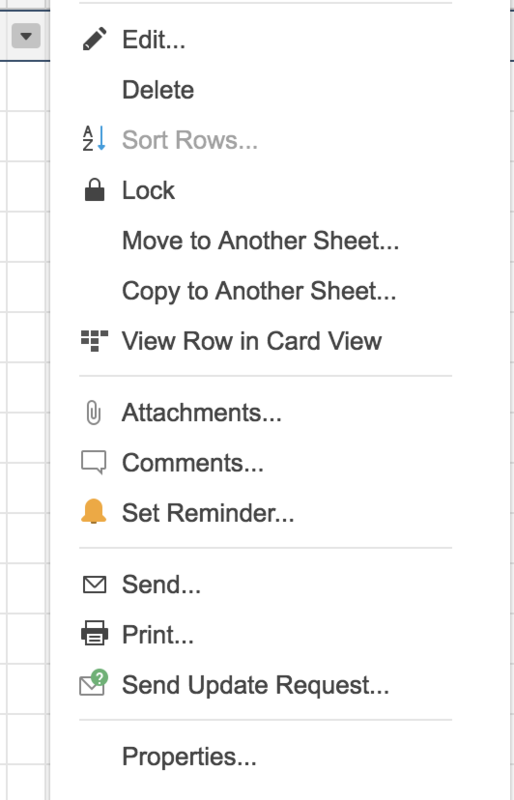 Here, we want to run our FLO when a new task (row) in Smartsheet is created. Let’s revise our FLO to add in a Trigger Event. To add an event, notice the large square to the left of the screen that says “Add an event to trigger your FLO”. Exercise 101-7 - Run the FLO! We have a fully fleshed-out FLO and are ready for testing! It’s good form to watch the FLO execute so you see data moving through the system. If everything is correct, you’ll see a notification in SLACK!